Hey there. Sorry I've taken so much time to update. I've been far too busy with things of little consequence that are necessary only to pay bills, but offer little more. Worse still, so much of my time is absorbed with the "day job" that I have less to create my own art. However, I have scrounged enough time to continue my new series of "Monster Copies." As most art students know, a great way to learn how to apply paint is to look at other paintings and try to copy what the artists did. I've done studies of Waterhouse, Caravaggio, and Hopper before, but only tried to match colors or compositions. In my earlier post of "Yellow and Blue Boy," I adapted the Gainsborough painting, "Blue Boy," to feature my brother's puppet character. 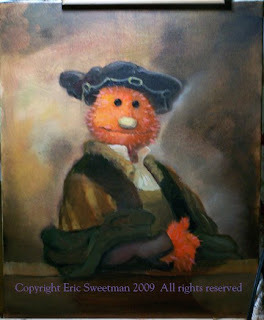 In the current post, I chose to place a very similar fuzzy puppet (still under construction by my brother) into Rembrandt's "Self-Portrait at Age 34," one of my favorite portraits. This is only the first pass at the painting. I plan on doing some glazing once I get another day off, but I like it for just 3 hours of work. With luck, I can post a final image, as well as some process work, before the end of the month.